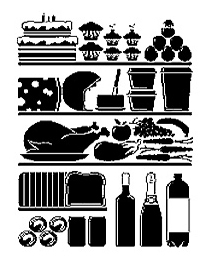 Measuring 29.5-inches by 19.5-inches, this X-Ray Kitchen Fridge Wall Sticker should fit nicely on your refrigerator door. Whether or not it is an accurate portrayal of the goods inside, well, that’s entirely up to you. In any event, the vinyl sticker is reusable, and part of a pretty cool looking set that features pieces appropriate for every room, from the bar to the living room, and yes, even to the bathroom.